Now that the Galaxy S7 and S7 Edge have arrived to consumer hands, we can finally begin exploring the nature of the Snapdragon 820 thanks to our first set of tests. While no amount of single-device testing will reveal the true nature of the 820, we can, at the very least, see how the 820 behaves inside the S7 and S7 Edge, and thus draw conclusions for the resulting performance of this particular package. Because we are testing the Snapdragon 820 confined in the S7 Edge and its waterproof body, and altered by TouchWiz and Samsung configurations, do not extrapolate our results: these scores and temperatures do not reveal how the 820 will behave in every flagship from now on, as many confounding variables will be different. Our sample consists of 5 devices with various processors: an iPhone 6S Plus (Apple A9), S7 Edge (Snapdragon 820), Note5 (Exynos 7420), Moto X Pure (Snapdragon 808) and Nexus 6P (Snapdragon 810), and the HTC One M9 (Snapdragon 810) except for thermal imaging. 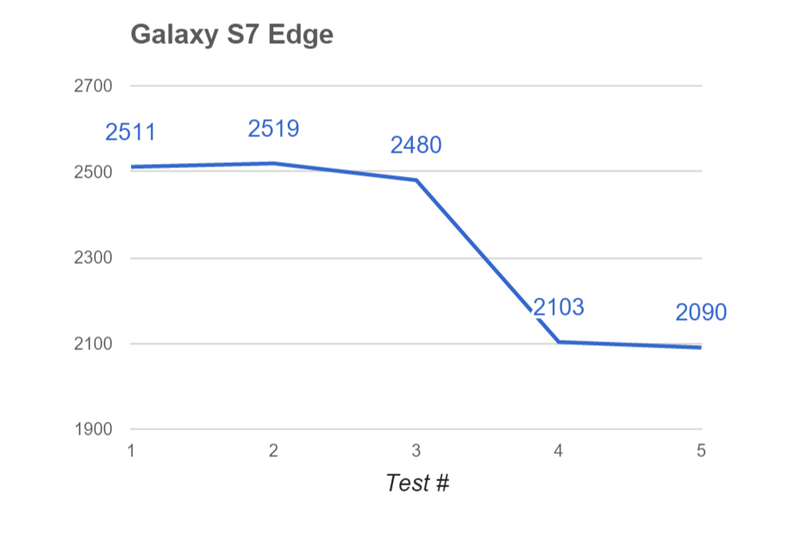 We found some interesting results that we’d like to share in preparation for our in-depth testing and subsequent S7 Edge review. Without further ado, let’s begin. Here we have the first set of results, after we ran 8 consecutive Geekbench tests. This is a CPU-intensive test that is also cross-platform, allowing us to compare Android and iOS scores. 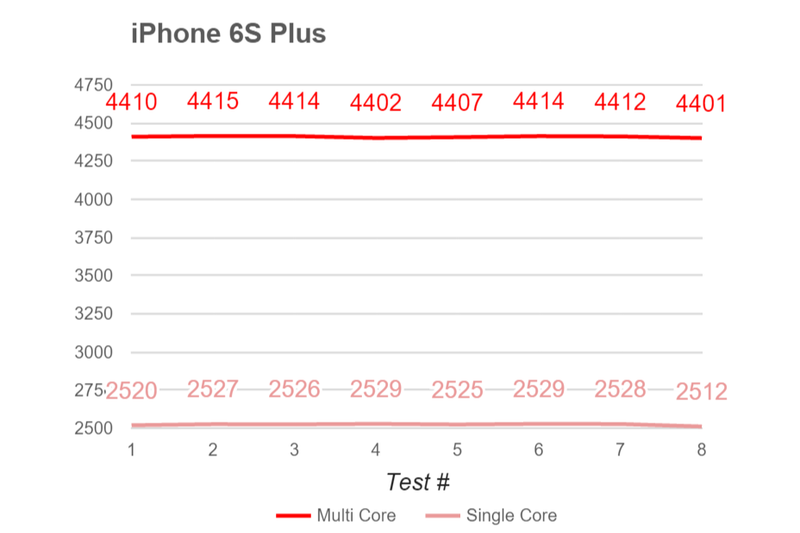 For those not familiar with the score breakdown, single core scores measure the performance of individual cores while multi core scores measure the performance of multiple cores at once. This distinction is important, because the Snapdragon 820 packs fewer (4) but more powerful cores than the Snapdragon 810 (8) and 808 (6), as reflected in single core scores. In these tests, the Snapdragon 820 in the S7 fared surprisingly well with virtually no signs of throttling, with the Nexus 6P and HTC One M9 seeing the highest declines consecutively and in the final scores. 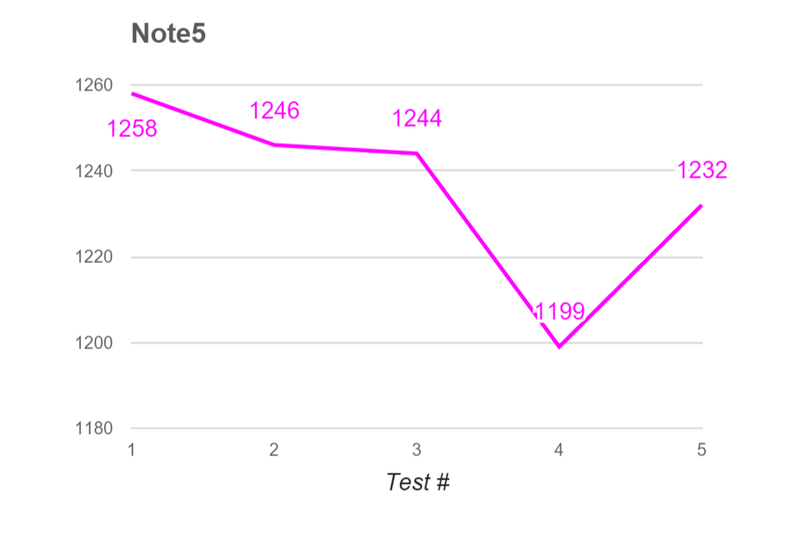 The Note5 proved remarkably efficient throughout, mirroring the results we obtained on our Note5 in-depth review last year. The Exynos 7420 proved its might once more, and luckily enough, the Snapdragon 820 in the S7 manages to not only score higher than all other devices, but also retain those scores and lead all the way to the end. Below you can see an image comparison that exemplifies the thermal performance seen after the CPU stress-test. 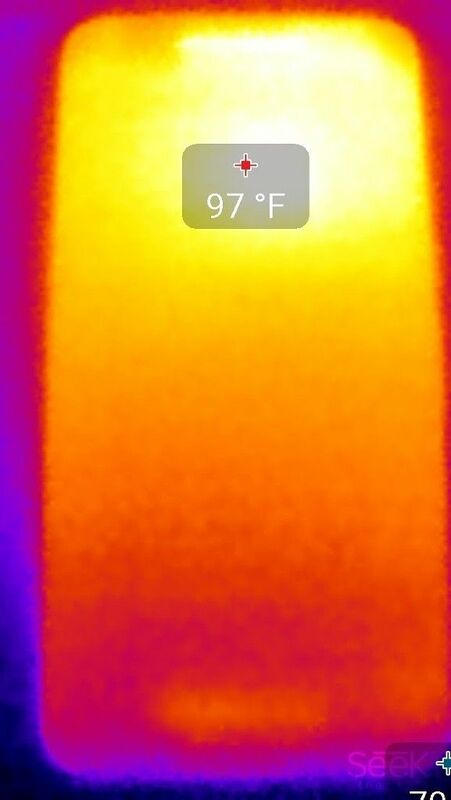 This image is telling as it shows the relative heat efficiency of each phone, with the ranking coming just as we expected and in-line with the final results of both of our tests. 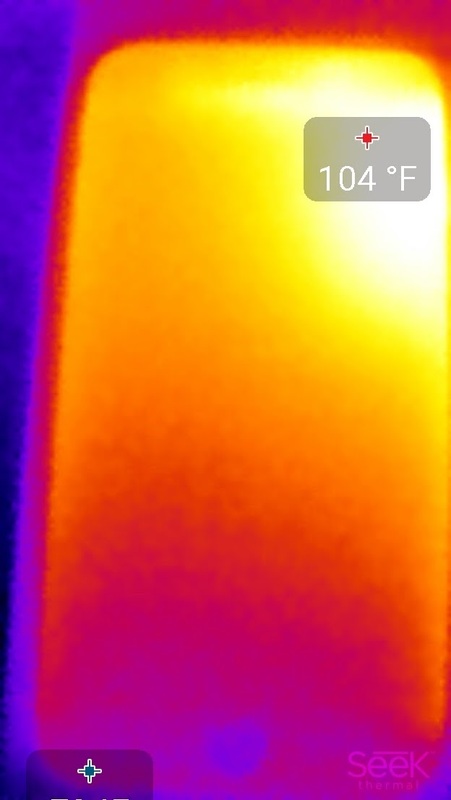 The iPhone 6S Plus (1st from the left) and Note5 (3rd from the left) show very good thermal efficiency (83°F|28.3°C). As we had noted in our Note5 review, the device rarely got hot, even under stress. 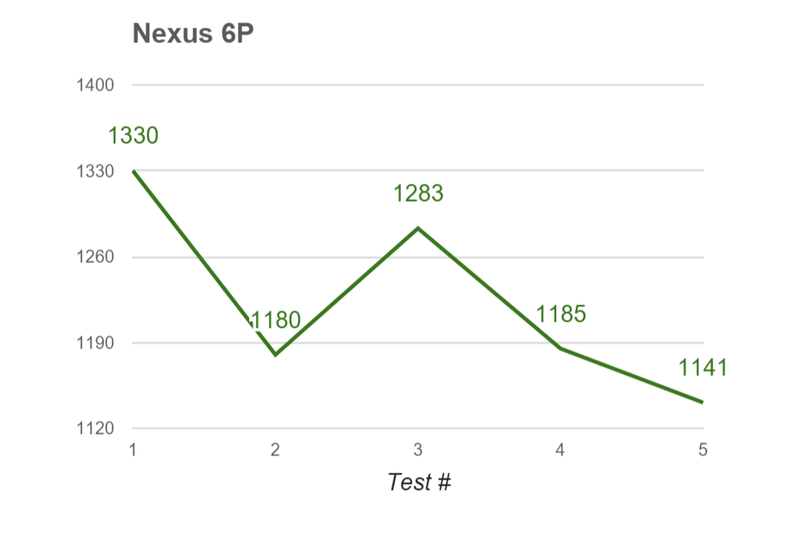 The Nexus 6P got the hottest at 95°F|35°C, followed by the Moto X Pure at 88°F|31.1°C, and then the S7 Edge. 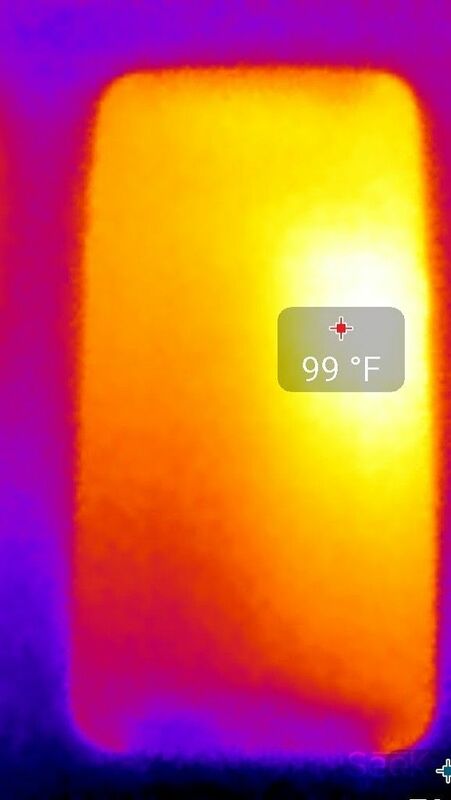 It’s worth noting that the S7 Edge managed to keep a good balance between performance and heat, reaching 84°F|28.9°C, whereas the X Pure and Nexus 6P show less-stable performance. Overall, the S7 Edge kept its cool similarly to the Note5 in this CPU test. The newest Adreno processor in the Snapdragon 820 promises up to 40% better performance, and considering how powerful mobile GPUs have been getting, this is nothing to scoff at. We ran our sample through 3DMark and found that the 820 did bring the S7 Edge a sizable increase over both the Nexus 6P and the Galaxy Note5. 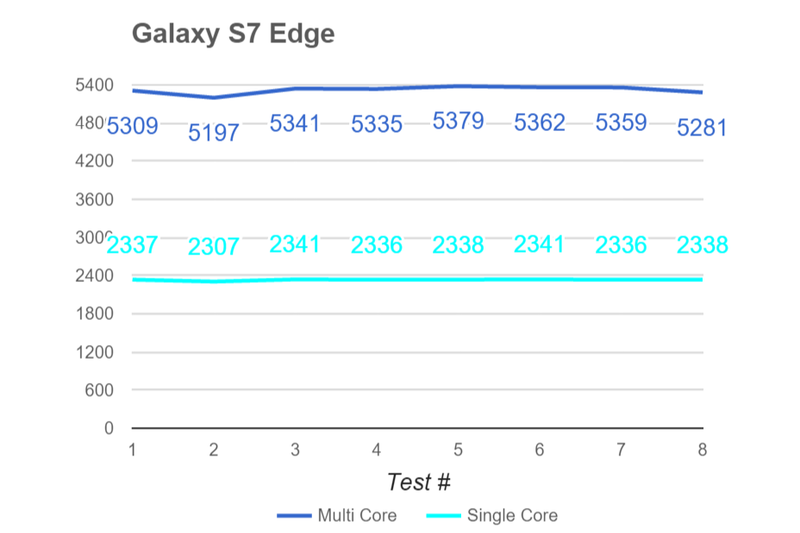 But unlike our CPU results, the S7 Edge couldn’t keep its lead over subsequent tests. 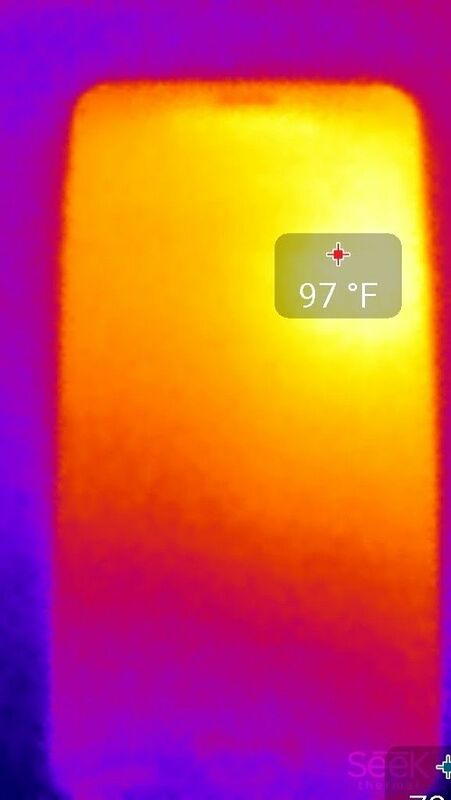 It’s worth noting that we let the devices cool down for 30 minutes in a 76°F|24.5°C room, but the initial temperatures were still not perfectly equal, likely due to the final temperature of the previous tests and the materials of the phones. 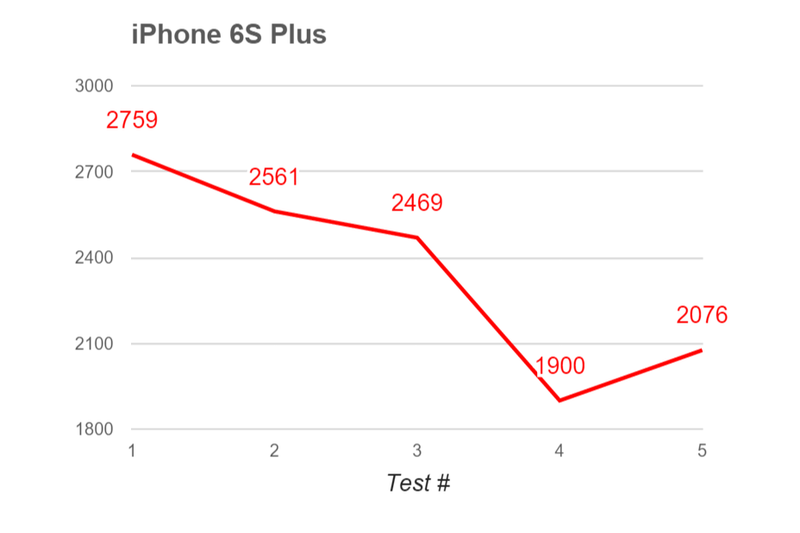 Surprisingly, the iPhone 6S Plus got the hottest under these tests, with the S7 Edge coming second. 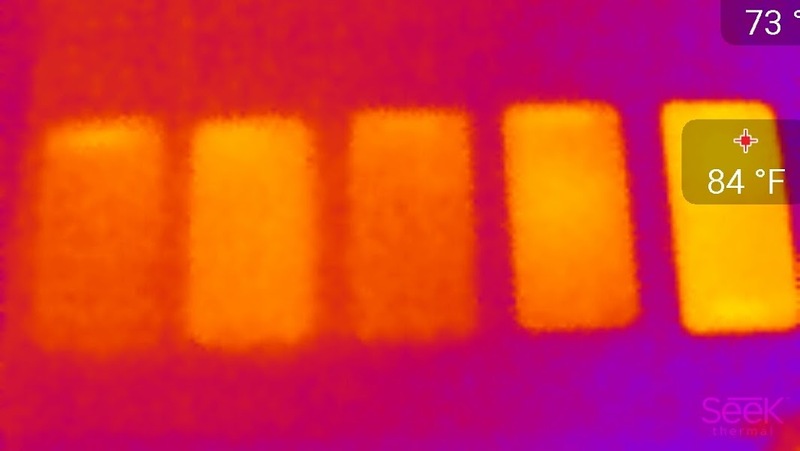 Both began the tests at the same temperature as the Note5, which didn’t get quite as hot, but managed to retain its score throughout the 5 rounds. 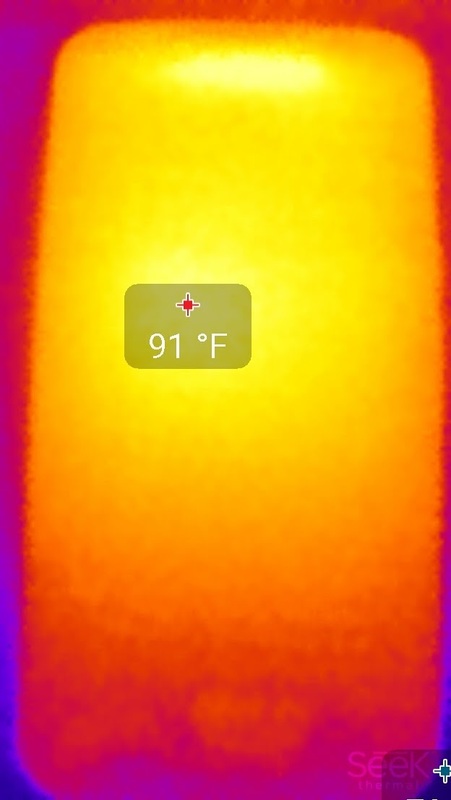 The Nexus 6P surprised us by only getting 2°F hotter than its initial temperature, which we don’t have a clear explanation for; it might so because this is a GPU-intensive test, and it was the CPU and not the Adreno 430 that suffered from architectural issues; thermal management and throttling were less of an issue, as the 430 is still a formidable mobile GPU. We reiterate: this is by no means representative of the 820 itself, as there are several confounding variables at play including but not limited to proprietary/software modifications, background services, internal hardware allocation, device volume, and more. This is also by no means an exhaustive analysis, but only the beginning of our in-depth testing. However, so far we can spot some interesting behavior displayed by the S7 Edge. First of all, the Snapdragon 820 does bring noticeable increases in theoretical performance, and this is a very welcome upgrade from what we saw in 2015. Indeed, we find that Qualcomm has managed to tame CPU throttling to a considerable degree. Further tests might reveal different results; if that’s the case, we’ll report back. GPU scores have also improved significantly, but it’s disappointing to see that the S7 Edge is not able to sustain its graphics performance through prolonged stress. That being said, the implications here are not too significant, and so far we haven’t had issues with Gear VR software/performance. Perhaps what’s most interesting, yet not shocking, is that we still managed to find lag across the user interface, including random stutters and framedrops. 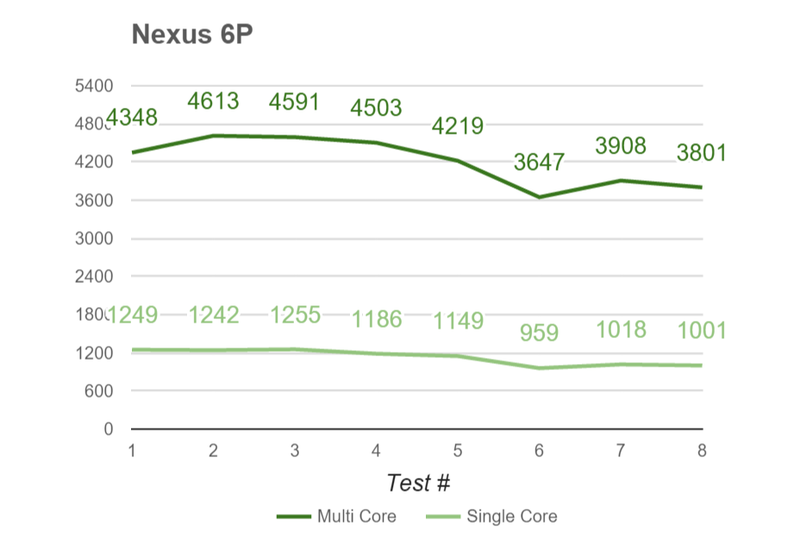 Indeed, our go-to GPU profiling test showed many skipped frames when scrolling through the Play Store, significantly more than our 810 devices running stock or close-to-stock software (Nexus 6P, OnePlus 2). We’ve also encountered random input lockups where performance did not take a hit but we simply couldn’t interact with the UI for a few seconds (repeated instances on the camera app and settings menu, reported by two XDA editors). We haven’t had our hands on this device for very long, and upcoming findings might reveal more about the nature of the S7 Edge, and in turn, further glimpses of the Snapdragon 820’s behavior under varied circumstances. For more coverage on the S7 and S7 Edge, stay tuned as our in-depth review will come soon™.